ZZYZX, CALIFORNIA–This was our last full day in the Mojave Desert, at least for this trip. Technically it was our coldest start yet (40°F), but the bright sun and lack of wind made it seem like our warmest. The day was mostly unstructured because we were going to try to find a geological site none of us had seen here: the lava tubes in the cinder cones area of the Mojave National Preserve. It was a good thing we left our schedule open because we missed not one turn, not two turns, but three crucial turns before we finally entered the tubes. I’ll take full responsibility, although in my defense I must point out that the Preserve is very coy with their signage and directions! 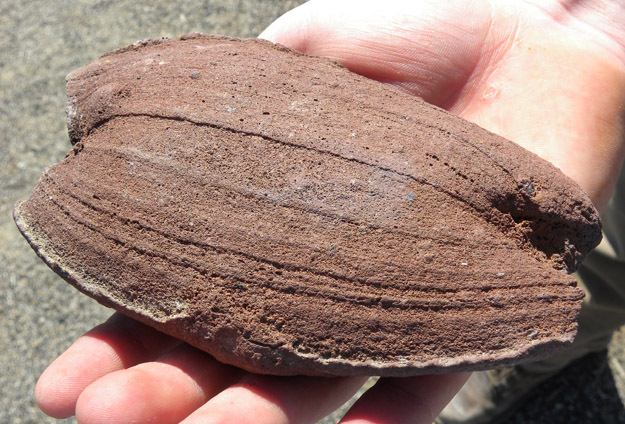 While exploring the desert during our lost phase today, Rob McConnell found this excellent volcanic bomb on one of the cinder cones. Note the streamlines formed as the molten lava cooled as it was thrown into the air. We can even tell which end hit the ground as it landed (the left). 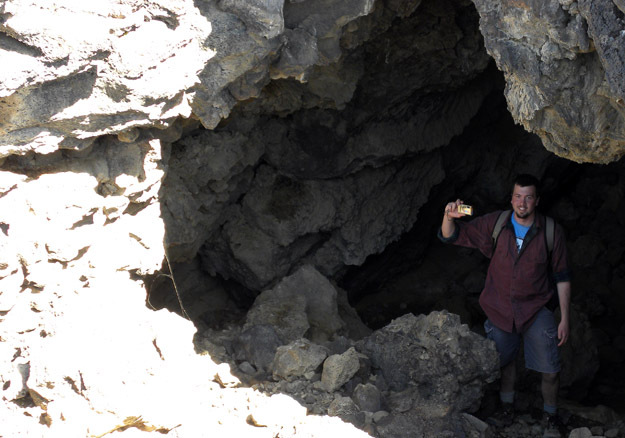 Rob Lydell at the entrance to the lava tube complex in the cinder cones region of the Mojave National Preserve. Michael Snader, Andrew Retzler and Stephanie Jarvis (looking very straight up!) 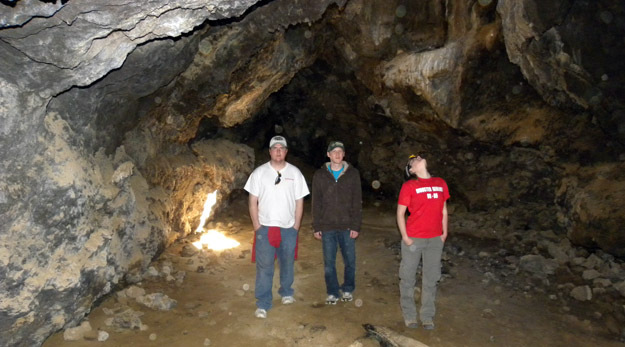 inside one of the lava tubes with light behind them shining through a hole in the roof. 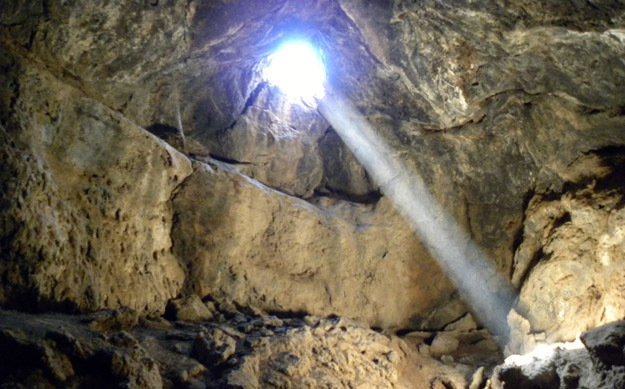 This light shaft is outlined by eolian dust it is passing through. After another delicious lunch packed for us by the Desert Studies Center staff (a shout-out to the world-class cook, our friend Eric), we drove north to Resting Springs Pass to study a famous exposure of a welded tuff. Our last stop was a descent through the 500,000 year-old beds of ancient Lake Tecopa to China Date Ranch where we looked around the oasis and had the famous (and expensive .. and over-rated) “date shakes”. (Think flurry with little date bits thrown in.) The students and other faculty enjoyed them, though, and they were in their eccentric way a fitting end to our Mojave adventure. 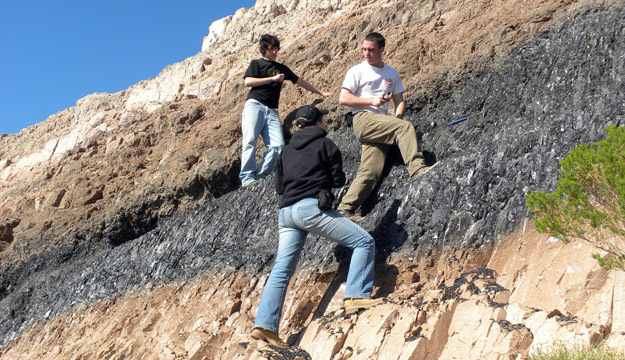 Wooster geologists on the welded tuff at Resting Springs Pass. 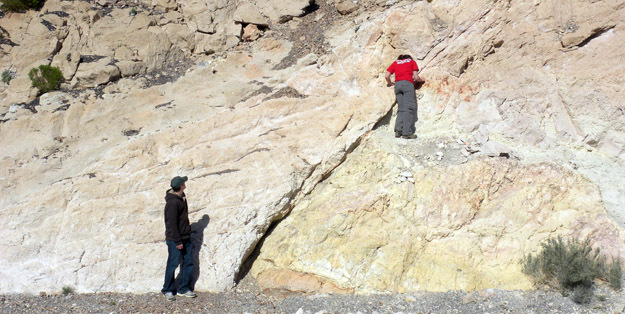 Andrew Retzler is standing on the down-dropped block on the left side of a fault at Resting Springs Pass, and Stephanie Jarvis is on the upthrown side. What kind of fault is it? 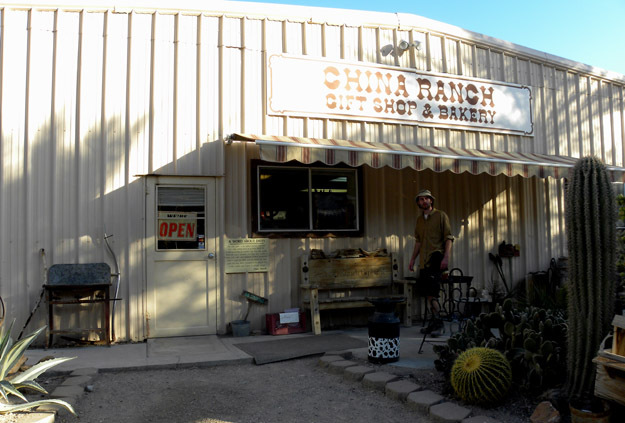 Travis Brown at the front of the store at China Date Ranch near Tecopa, California. Proof that the date shakes at China Date Ranch were popular. 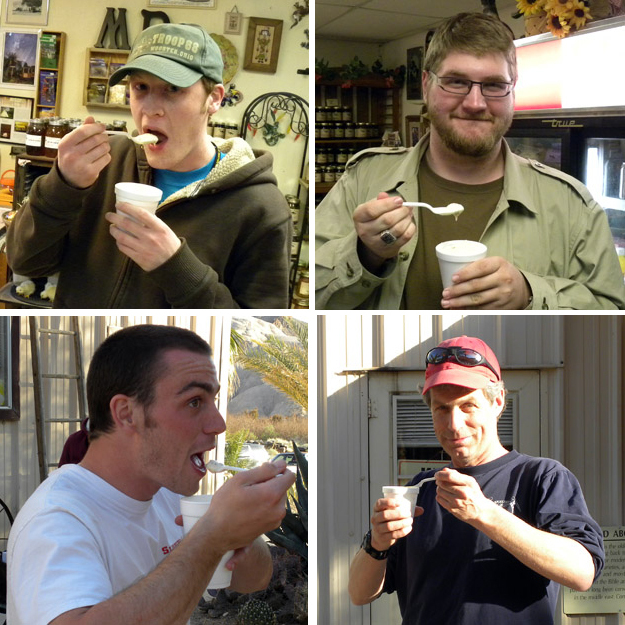 From the top left, clockwise: Andrew Retzler, Micah Risacher, Greg Wiles, Rob McConnell. Unless my colleagues surprise me this evening, this will be our last post from the Mojave. We will have many more entries for this field trip, though, as we sort through student images and observations back on campus. We will also add more technical notes about the sites we saw, and maybe even throw in a video or two. It has been an extraordinary trip which will live in our departmental memory for a very long time.